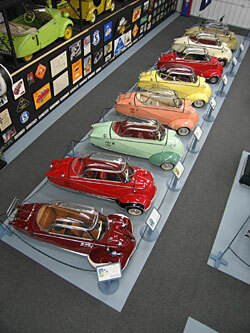 The microcar, a vehicle born out of need, was a child of its time and became the symbol of a people's spirit. World War II came to an end in 1945 and Europe lay in ruins. A shell-shocked population came out of the bomb shelters and faced an unimaginable scene of devastation and ruin. As if the seemingly endless task of clearing away the rubble wasn't enough, there were crippling shortages of food, raw materials, electricity and gas. Value and worth were measured in Chesterfield cigarettes. The population collectively rolled up its sleeves and went to work. The astonishing rebuilding of an entire continent over a period of ten years was accomplished through a unity of spirit and purpose unimaginable today. Bright, talented engineers, many out of the former aircraft industry, put their minds to the problems of mobilizing the population under adverse conditions. It's said that the true master reveals himself within limitations and so this focusing of energy and talent resulted in an enormous variety of small vehicles; some successful, others less so - but all of them interesting! 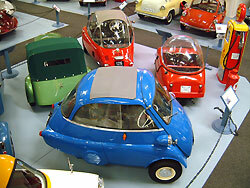 The microcar or "bubble car" came to symbolize this period of renewed energy and pulling together. The bubble car boom lasted only a decade, but the period left a lasting impression even on those who abandoned their Kabinenroller for a "real" car. 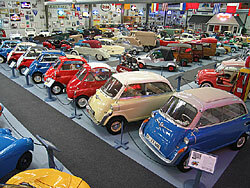 The cars continue to be found in barns and collections throughout the world but are particularly meaningful to the Europeans, whose lifestyle was, in part, made possible by these tiny cars. 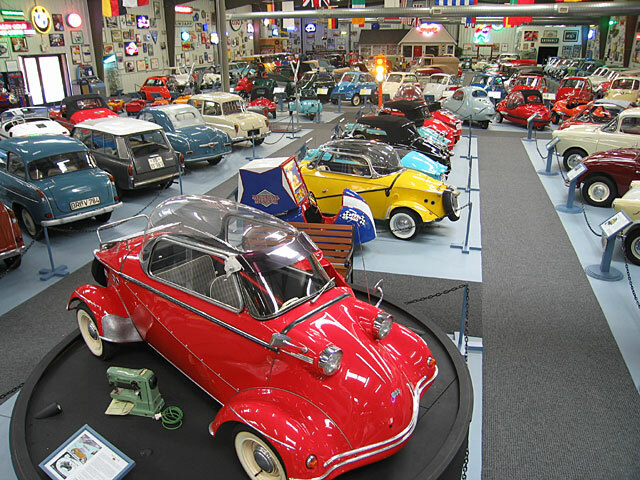 The Museum Collection is primarily focused on Microcars in the late 1940's- pre-1964 range with Engine sizes of 700cc or less (many are 250cc and 50cc) and 2 doors or less. Madison, Georgia, population 5000, is annually host to more than 35,000 visitors who come to see the town's beautiful antebellum and Victorian homes as well as its lovely historic downtown commercial district. Listed on the National Registry of Historic Places, Madison is steeped in history and beauty. The Museum Collection in Madison GA is now closed to the General Public. Check Back for something new. 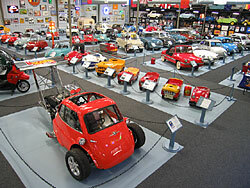 The Bruce Weiner Microcar Museum Inc. is a not-for-profit organization operating under Federal 501(c)3 Status. Our goal is to educate future generations about the historical importance that microcars played throughout the world in the evolution of personal transportation.